However, operating at greater distances from China places greater demands on its naval platforms as it becomes far more difficult to support surface ships, submarines, and aircraft the farther they move away from the coast. If we look at the desired capabilities for Far Seas operations, then we should expect improvements in surface combatant area anti-air defenses, anti-submarine warfare, and strike warfare. Chinese deck aviation components are largely air defense assets right now. A robust land attack/strike capability is the next step. Improvements in acoustic quieting are absolutely necessary if PLAN submarines are to survive being targeted in deeper, blue water environments. Shifts toward anti-submarine and strike warfare will represent the biggest likely changes in combat capabilities. Also required: a significant improvement in Chinese logistics support to sustain deployed platforms. The PLAN has started actively pursuing these goals, but it will take some time before it masters them. SD: China’s rise as a global sea-going power is recent, relatively speaking. Has China’s shipbuilding industry been more proactive or reactive to perceived and notional threats? How does the influence of the Chinese Communist Party affect this? One facet your contributors raise repeatedly is Chinese civilian shipyards’ overcapacity and the problems stemming from that. AE: China’s shipbuilding industry has been assigned an important role and set of requirements by its civilian and military masters: the Party, State, and PLA. The present naval buildout dates to the mid-1990s, apparently catalyzed and accelerated in part by a series of events that impressed China’s leaders with their inability to counter American military dominance. These included Operation Desert Storm (1991), the Third Taiwan Strait Crisis (1995-96), and the Belgrade Embassy Bombing (1999). This suggests that China has been more reactive than proactive regarding external events that affected it at a national level. The fact that many PLAN systems are based on foreign systems reinforces this reactive aspect. That said, China’s rapid growth also means that it is closing the technological gap and is nearing a point where it could transition to a more proactive approach. SD: One absolutely fascinating aspect of Chinese shipyard infrastructure is that its two largest conglomerates, China Shipbuilding Industry Corporation (CSIC) and China State Shipbuilding Corporation (CSSC), are publicly traded. Have you given any thought to the potential oddities or complications of such an arrangement? AE: Yes—discussion of this arrangement and its implications has pervaded the conference and the book. China’s state shipbuilders enjoy diversifying bases and increasing extent of financial resources, potentially facilitating greater dynamism and innovation. Following the past decade-plus boom and recent consolidation, depressed civilian demand creates mounting incentives to seek compensatory naval contracts. Yet these state-owned enterprises retain tremendous inefficiencies. Their institutional culture remains influenced by legacy values, norms, and incentives. Their monopoly structure remains one of the central impediments to improving efficiency and innovation. On the other hand, private yards are oriented toward short-term, profit-minded thinking and are not funded to engage in long-term R&D-intensive projects. While CSIC and CSSC have increasingly undertaken naval and para-naval business to absorb excess yard capacity after commercial “Peak Ship” construction occurred around 2012, private yards have largely been left to fend for themselves. Throughout the industry, bureaucratic barriers to efficiency and effectiveness remain a problem, especially for propulsion and shipboard electronic systems and their integration into ships. SD: Can you speak to the issue of maintenance? Was this new expanded fleet designed with any kind of maintenance scheme or program in mind? Do you foresee effective maintenance being a limiting factor for the PLAN in the near future, and why? AE: As one of the conference attendees with shipyard management experience emphasized, a navy’s ownership of ships has not one but three basic phases: (1) platform/system acquisition, (2) operations/sustainment/modernization, and (3) disposal. China has pursued phase one front-end procurement with alacrity, but lacks the comprehensive familiarity with phase two that a more mature navy, like that of the United States, has learned through painful, expensive experience. American public and private sector infrastructure (the industrial base) dedicated to lifecycle sustainment is significantly larger than the industrial base necessary to build ships. Like a goat that tasted great but will strain a python’s digestive tract, a major mid-life maintenance bill for the overhauls of all China’s new ships will start coming due in the next 5-10 years. This requirement to “pay the piper” after years of massive buildout and increasing deployment amid acute maintenance infrastructure underinvestment haunted Soviet naval development in decades past; China may now be poised to reap a similar whirlwind even as economic slowdown imposes tougher tradeoffs. In any event, China’s investment in sustainment and modernization will inform its strategy for naval operations; this merits further research. Related questions concern the degree to which China is developing an inventory of repair parts and logistics infrastructure; as well as the extent of its surge capacity to sustain a fleet suffering significant battle damage. SD: An issue of great interest to our readers is the possibility of President-elect Trump’s promise of a “350-ship Navy” and increased military spending across the board. Do you believe that such a development (to the extent possible over the short-term of a 4-to-8-year administration) will have an effect on the way China develops its shipbuilding industry and Navy? AE: Both the United States and China appear to be in a state of considerable flux, at least from a naval force structure perspective. The U.S. shipbuilding plan has been in disarray. The Congressionally-mandated Alternative Carrier Study and the USN-sponsored Fleet Architecture Study are designed to provide significant input to the Force Structure Assessment being assembled by N81, the Assessment Division of the Office of the Chief of Naval Operations. As part of the Fleet Architecture Study, Congress has requested alternative reports from a federally-funded research and development center (FFRDC) and a private think tank. These efforts are envisioned to inform the fiscal year 2018 budget and the new thirty-year shipbuilding plan. This new thinking, combined with President-elect Trump’s proposed initiative, has made the American side of any future strategic comparison extremely fluid. Given the challenges at hand, it is imperative that the next Secretary of the Navy come into the job with deep knowledge and experience concerning fleet architecture and construction. Congressman J. Randy Forbes, who has endorsed our volume, is considered by many in the USN and shipbuilding communities to be the ideal candidate. As for China, its slowing economy and gross overcapacity in many industrial areas make it very unlikely to be able to remain on the current shipbuilding binge. Any straight-line projection based on the last 10-15 years is therefore fraught with peril. Nevertheless, China has already parlayed its possession of the world’s second largest economy and defense budget into the world’s second most powerful navy. Working with China’s other services, the PLAN will be increasingly capable of contesting American sea control within growing range rings extending beyond Beijing’s unresolved feature and maritime claims in the East and South China Seas. Moreover, China is spending a relatively low percentage of GDP on defense, and could afford to greatly increase spending on naval shipbuilding if determined to do so. SD: The text concludes that, should spending and shipbuilding continue on its current trajectory, the PLAN will be a match for the U.S. Navy in terms of hardware by 2030. In realistic terms, how and where are the first dollars of notional increased U.S. military spending applied to best protect the primacy of American sea power? Is there a realistic way for Washington to address this in the (relatively short) time frame of 14 years? 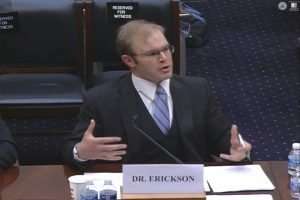 Dr. Erickson testifying before Congress. AE: As I’ve testified before Congress, the place for Washington to start is clear: maintain and build on formidable undersea advantages to which Beijing lacks effective countermeasures and would have to invest vastly disproportionate resources in a slow, likely futile effort to close the gap. American shipyards can expand production lines already in use to increase the construction rate of Virginia-class nuclear-powered attack submarines (SSNs) from two-and-potentially-falling to a solid three per year. These submarines are ideal for denying China the ability to hold and resupply any forcefully seized features. The Virginia Payload Module allows for useful increases in missile capacity. Given China’s ongoing limitations in anti-submarine warfare and the inherent difficulty of progressing in this field, it could spend many times the cost of these SSNs and still not be able to counter them effectively. 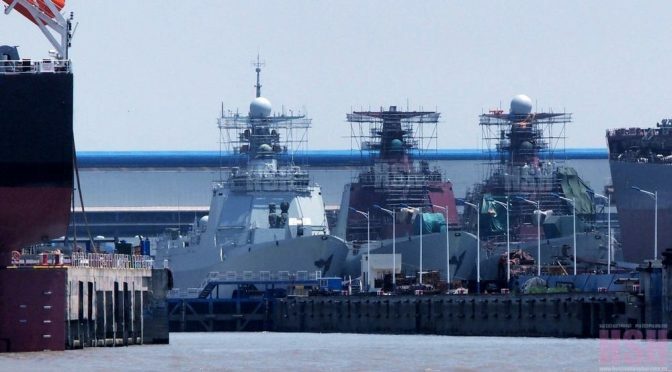 SD: Part Two of Chinese Naval Shipbuilding addressed some historical peculiarities of China’s shipyard infrastructure compared to that of other nations with similar or comparable capability, including the Republic of South Korea (ROK), its closest regional competitor in terms of tonnage produced. What’s striking is the diversity of output, turnover of new facilities/closing of old ones, and the variable nature of investment and success. One reason given for this by contributors Sue Hall and Audrye Wong is the “intermingling of merchant and military shipbuilding.” How will consolidating military shipbuilding under a state umbrella improve or restrict the PLAN’s growth? AE: Privately-owned Chinese shipyards remain weak compared to Korean and Japanese counterparts. It is large state-owned enterprises that will likely lead Beijing’s maritime strategic-industrial transformation. In aggregate, and increasingly together, CSIC and CSSC possess great resources and capacity. CSIC and CSSC were unified until 1999, then divided along geographic and functional lines so as not to compete directly. CSIC has the majority of R&D centers, and is to date the primary builder of surface ships and submarines for the PLAN. Some of our contributors believe true reintegration will occur—as widely reported in Chinese and foreign media—as part of broader efforts to increase efficiency and available resources and to consolidate China’s shipbuilding industry into fewer facilities of greater quality and capability, specifically to reach a State Council-mandated reduction in the number of commercial shipyards from several hundred to sixty. Those doubting that meaningful merger will occur observed that most unions to date exploit geographical efficiencies and that this “low-hanging fruit” has been thoroughly plucked. China is also attempting to ameliorate organizational and technological impediments by emphasizing integration of commercial and naval shipbuilding processes, which some industry experts believe could improve quality and efficiency. Reflecting widespread skepticism among Western specialists concerning the extent and efficacy of such approaches, others maintain that this will actually reduce efficiency and increase challenges because of the fundamentally different natures of naval and commercial shipbuilding. If China somehow succeeds in enhancing market-oriented performance while strengthening centralized oversight—a difficult combination to achieve—it will have the wherewithal to deploy a formidable navy indeed. SD: One aspect of the PLAN we haven’t discussed much is the development of a robust domestic nuclear submarine program. According to an IHS Jane’s Defence and Security Forecast cited in the book, some $27 billion will be applied to new nuclear- and conventionally-powered projects in the coming years. Why has the PLAN struggled to make the kinds of strides in its subsurface fleet as it has in other areas, and how do you foresee the PLAN’s subsurface fleet evolving between now and 2030? AE: Propulsion quite literally determines how fast and far Chinese warships can go, and what they can accomplish in many respects. Yet it remains the Chinese shipbuilding industry’s single biggest shortcoming, and hence one of China’s key naval weaknesses. The PLAN is, literally, underpowered; a situation that is unlikely to progress until China’s precision manufacturing capability improves. Nuclear propulsion advances—especially in power density and acoustic quieting—remain difficult to ascertain, but a key variable affecting future progress will be the degree of Russian assistance. China is working hard to acquire, develop, and master relevant technologies, but improvements will be slow, difficult, and expensive. Another related issue is that PLAN nuclear submarines are noisy. This is a significant problem, not only from a survival perspective, but also because high self-noise degrades the ability of the submarine to search effectively. SD: Speaking of subsurface advancements, you and your chapter co-authors discuss the role and possible overstated impact of Air-Independent Power (AIP) technologies with regard to newer conventional Chinese submarines. Many see the efficacy and impact of AIP on China’s subsurface prowess as somewhat of a foregone conclusion, but perhaps that isn’t so. Can you expand on that a bit for the AIP-believers in our readership? AE: Sea power requires tremendous power! Propulsion determines how fast and far a ship can go; overall power determines what it can accomplish in a given location. The density of water (829 times greater than air) imposes an unforgiving reality on these dynamics: the cubic, or greater, relationship between power and speed. For a ship to go three times faster, at least twenty seven-times the power is needed. Furthermore, modern advanced weapons systems require high and growing amounts of power to operate their sensors and weapon systems. Nuclear power, the ultimate gold standard, offers unparalleled performance. Among conventional systems, AIP greatly extends the time a submarine can cruise at low speed without draining its battery and risking detection. AIP systems have significant limitations, however: they require large tanks that are cumbersome to deal with in the design, they do not eliminate the need for the submarine to ventilate, and they do not add to the time a boat can operate at a “burst” speed. All variants suffer shortcomings. Fuel cells require ultra-pure metal hydrides that need several dozen hours to refuel with hydrogen—a dangerous fuel. Even advanced Sterling AIP suffers limited efficiency in using oxygen and the products of combustion have to be pumped overboard, creating depth constraints and additional rotating machinery noises. In sum, an AIP submarine has far too little power or stored energy to resemble a “baby nuke.” Germany and Japan are introducing Lithium-ion batteries as a conventional power alternative; Chinese researchers are watching this trend closely. SD: We would be remiss not to mention China’s aircraft carrier ambitions. How important is the development of an indigenous aircraft carrier program to the PLAN’s overall viability as a global sea power, and what barriers remain for China’s shipbuilding industry in pursuing a fleet of domestically designed aircraft carriers? AE: Given difficulties inherent in upgrading marine and aviation propulsion, power, and launch technologies—as well as motivations and choices informing it—an evolutionary design path seems likely for China’s aircraft carrier program. This is part of a larger pattern of substantial remaining challenges for China’s shipbuilding industry, particularly in the area of systems integration. Compared to the United States, China retains particular shipbuilding limitations concerning propulsion, information technology, aviation, certain advanced weapons systems, and other complex systems. For example, shipboard electronics are important to the PLAN’s desired upward trajectory in sophistication, scope, and scale of operations. However, in-depth examination of the Type 054A Jiangkai-II frigate’s electronics suite suggests that—despite increasing prioritization—organizational parochialism, insufficient coordination, and other inefficiencies continue to impede Chinese progress in this vital area. Common to these bottlenecks is the centrality of sensitive, high-performance components that must work together as a sophisticated system-of-systems. This makes it particularly difficult for China to successfully pursue its preferred hybrid approach: obtaining critical foreign technologies and other inputs, developing indigenously those unavailable from abroad, and integrating the results on a “good enough” basis. SD: Let’s wrap up with a final, and admittedly awfully broad, question. It’s becoming more expensive for the United States to build and maintain high-end warships. Is this same trend true of China and, whether or not the answer is yes, what are the implications of that for the global balance of power? AE: For over a decade, China’s military maritime modernization effort (including its shipbuilding output) has affected requirements for USN capabilities, particularly by renewing focus on high-end warfare. This has triggered intense debates concerning strategy, budgets, and force architecture, which remain ongoing. The largest, most capable components of China’s growing Chinese distant-waters fleet will increasingly resemble a smaller version of the USN. China will thus have impressive Far Seas-relevant naval forces second only to those of the United States. However, Beijing has not yet fully experienced the true long-term cost of sustaining top-tier sea power, which tends to eventually outpace economic growth substantially. This will impose difficult tradeoffs concerning budgets and force structure. In an exceptional achievement for a historically continental power, China has already arrived as a major maritime nation, but will face increasingly difficult choices moving forward. Message to Beijing: welcome to the sea power club; now, be careful what you wish for! Dr. Andrew S. Erickson is Professor of Strategy in the U.S. Naval War College’s China Maritime Studies Institute and Associate in Research at Harvard University’s John King Fairbank Center for Chinese Studies. 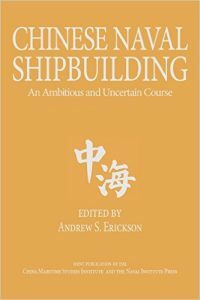 Erickson is the editor of, and a contributor to, two volumes: Chinese Naval Shipbuilding (Naval Institute Press, 2016) and Proceedings of the 47th History Symposium of the International Academy of Astronautics (Univelt, 2015). He is coeditor of, and a contributor to, eight volumes; including the remainder of the six-volume Naval Institute Press book series, “Studies in Chinese Maritime Development.” The views expressed here are his alone. Sally DeBoer is serving as the President of CIMSEC for 2016-2017.